We always complain about how long the week is or how horrible your day has been, always remarking “Oh my gawd, can you believe it’s only Wednesday?” or “Ugh, worst Monday ever.” But looking back on my year, I forget all the long sleepless nights I spent studying for a Global History test and the week that me and my best friend didn’t talk because of a stupid fight, and I only remember the best times I had. I definitely grew as a person this year, stepping out of my comfort zone and trying new things! I also learned so much from school, from the Fashion Institute of Technology, and from my experiences. I’ve still got a long way to go and much more time to figure myself out but I know I have come one step closer to coming into my own. I put together a ton of photos from some of the great times I had this year! I hope you had as good of a year as I did. In January, I had my Sweeet 16 party. This fairytale is definitely one I’ll never forget! As odd as it is for a teenager, I absolutely love going to the Metropolitan Museum of Art in NYC. All of the culture and art fascinates me. I could spend the whole day there wandering around. This spring break was the best one I’ve had my whole life. My family and I went to California and spent half our vacation in Los Angeles and the other half in San Diego. I’m dying to take another vacay there. I have the best friends ever. 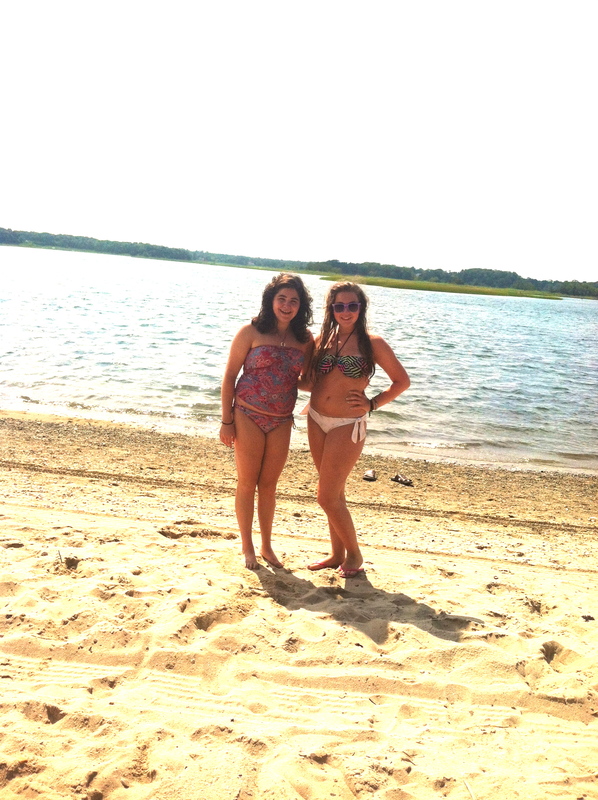 One of my best friends took me to the Hamptons for a weekend trip early in the summer! As you may or may not know, I am a huge Demi Lovato fan. She is just perfect in every way so me and some of my friends went to a Demi concert together in June! I even have the best time when I’m just laying around at the beach or the pool with my friends. During the summer my sister and I saw our fair share of concerts including Cobra Starship, Marina and the Diamonds, Brookline Drive, Neon Trees, Megan and Liz, and another Demi Lovato concert!! We also met Lindsey Shaw from Pretty Little Liars in NYC!!!! 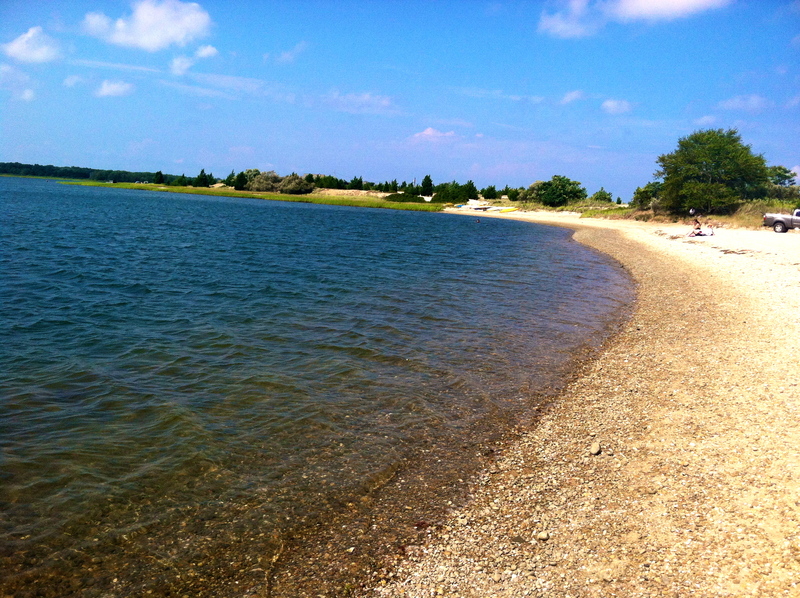 And another great weekend in the Hamptons! Happy Halloween from the superheroes! My high school football team is incredibly talented and they made it all the way to state finals and they won! The game was up in Syracuse, NY so my best friend Danielle and I spent the weekend there. Every Saturday during the fall and winter I took an International Fashion Marketing class at FIT and absolutely loved it! I hope 2013 treats us well!! Happy New Year! Sometimes all you need is a quick little vacay to whisk you away from your troubles and to refresh your mind! I was living the care free life! 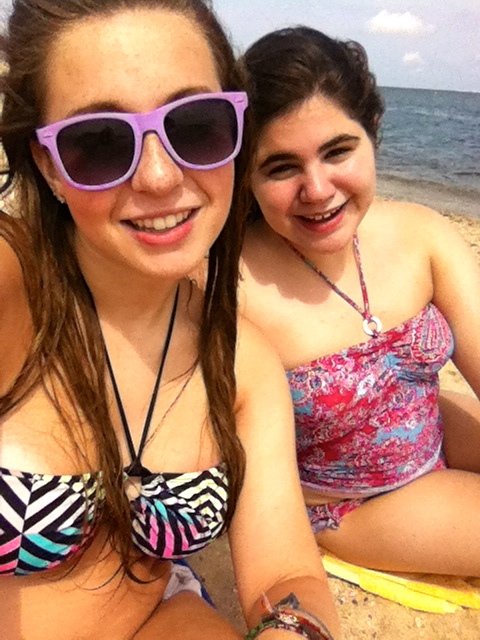 We swam in the bay, tanned at the beach, shopped in all of the boutiques, and went out for dinner and ice cream. The best part of it all was to be able to do it all with my best friend. I really had an amazing time and i don’t think I’ll ever forget it! We took this pic when we were out shopping in the stylish South Hampton! We were playing dress up in LF (one of my fav stores!) and we found these crazy outfits! Danielle is wearing a wild studded tie dye demin jacket and I’m wearing a sequin cocktail dress! Check out our Jeffrey Campbell shoes too!! We love them!! 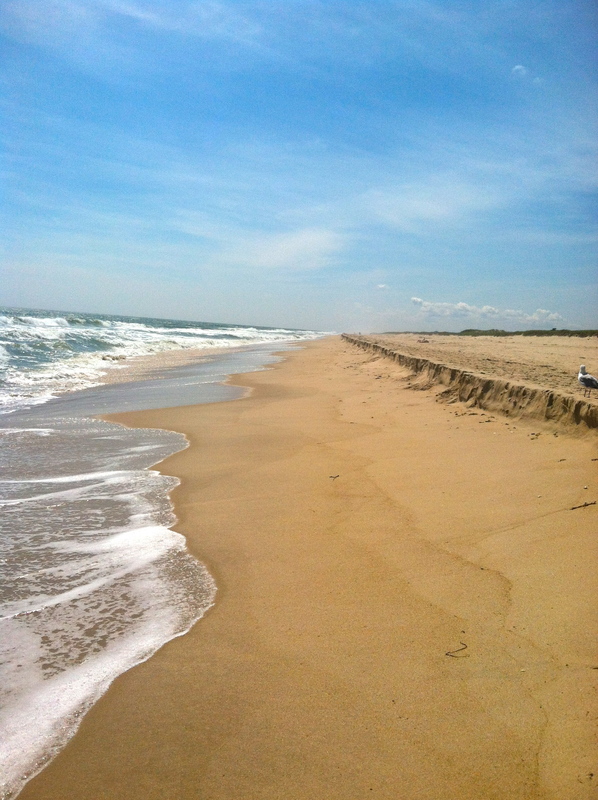 On one of the nicer days I was in East Hampton, we went to this spectacular beach called Indian Wells and it was such a clean and private beach. 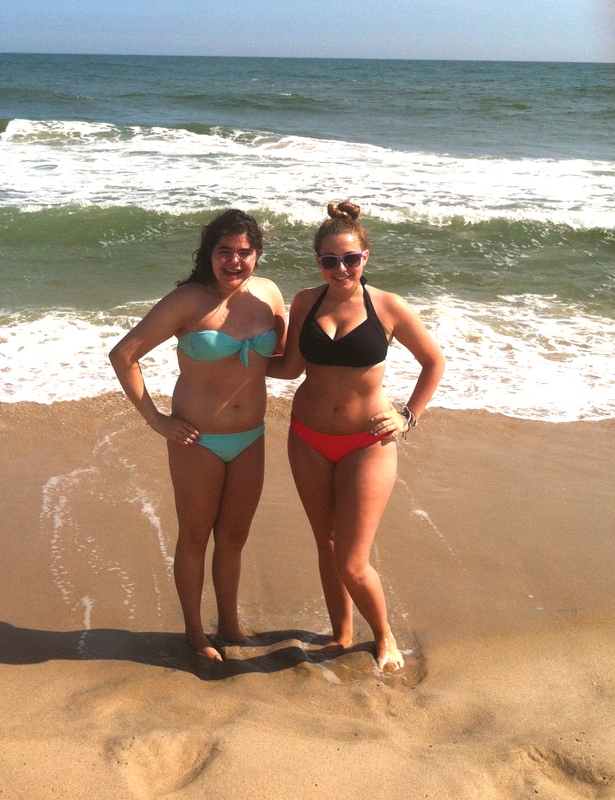 There were only a few other beach go-ers! It was so calm and quiet (besides the strong rip tides!!) We took the opportunity to get some sun and take some pictures! Hey Girlies! Ever wondered what to pack and what not to? Me too. And to be honest, I haven’t yet figured out the best to pack. Usually in situations when I’m going on vacation and I need to pack I either 1. not pack nearly enough stuff and always forget important things or 2. pack an excessive amount of stuff in a big, heavy bag and have everything I need. I really don’t know which option is better. Today I had this problem because tomorrow morning my best friend and I are going to the Hamptons for the next few days! We are going to take a coach bus out there and stay at her granny’s house, how fun right?! I was utterly conflicted whether to bring a smaller bag and risk forgetting the essentials or to bring an elephantine bag which would carry excess stuff. I chose to bring my (big) Betsey Johnson carrier which pretty much a very large, very stylish duffle bag. It is filled to the brim with bright bikinis, short shorts, and crop tops, just what everyone needs on their vacay! I’m triple checking everything to make I don’t forget anything for my trip because last time I forgot my brush, YIKES. Also, in preparation for my sweet getaway, I did my own mani-pedi today! In case any of you were wondering… I used Minted by Revlon on my fingers for that effortless chic-ness and Let’s Talk by Sinful Colors on my toes for a little pop of sass. Lastly, as some of you may know, my family and I went to see Pat Benatar in concert last night at the Six Flags Great Adventure in New Jersey! I must say, she’s still got it. Pat is 59 years old and she still belts out some high notes and busts some moves! She is quite a legend and a true talent! Who doesn’t love the 80’s? It was the era of dreams and the disco! My family bought season passes for Six Flags back in November so now we’re putting them to good use! We went to the park a little less then a month ago to go on the rides and to see Cobra Starship perform! During the summer, at Six Flags, there are free concerts! Isn’t that so fun?! Anywayyss… Today we are going to Six Flags again to go see the amazing PAT BENATAR!! My parents really like her and I know some of more popular songs like Love is a Battlefield. I’m just hoping that the weather holds out because there is a chance of thunderstorms all day. I am going to hopefully put out good vibes by leaving my umbrella home and wearing my black demin cut-offs and my vintage Boston tour shirt! Wish me luck on all the rides!! I have always been a tad skeptical when it came to the extent of photoshopping in teen magazines like any other person would be. Many companies have recently been put under fire due to over-editing their photos and ads and creating an unrealistic role model for teens everywhere (no one is expected to be a size 00 or to have long, lean legs!). 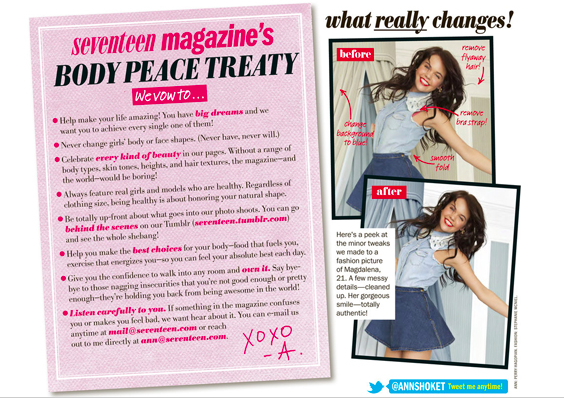 I must say I was super- duper relieved when Seventeen Magazine published in their latest issue that they keep their photoshopping to a minimum. The editor of this amazing mag, Ann Shoket, wrote on page 12 that yes, they do edit their pictures but they only make minor changes, anything more than that is not necessary. Ann wrote that “…we retouch images- removing wrinkles in fabric, stray hairs, a few zits, random bra straps- but we never alter the way the girls on our pages really look.” (Reassuring, right?!) Ann and Seventeen Magazine team are dedicated to showcasing how naturally beautiful girls are and assuring that their bodies and minds are both healthy. It makes me feel so much better that all of the content is encouraging, realistic, and virtually unchanged. I also love that the mag features girls of all shapes, sizes, and skin tones! The pictures on the right show the changes the editors make to their pictures; there aren’t any drastic changes and only minor things are altered. 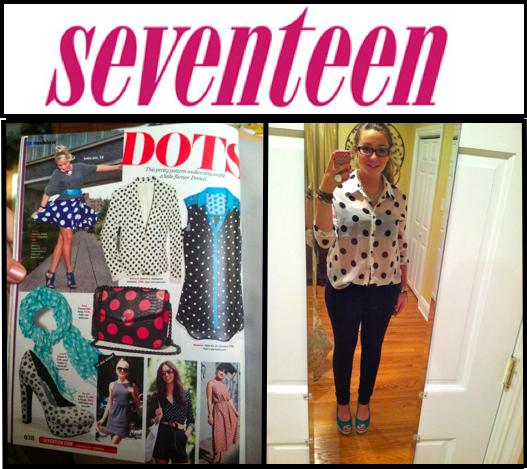 Go Seventeen Magazine! !